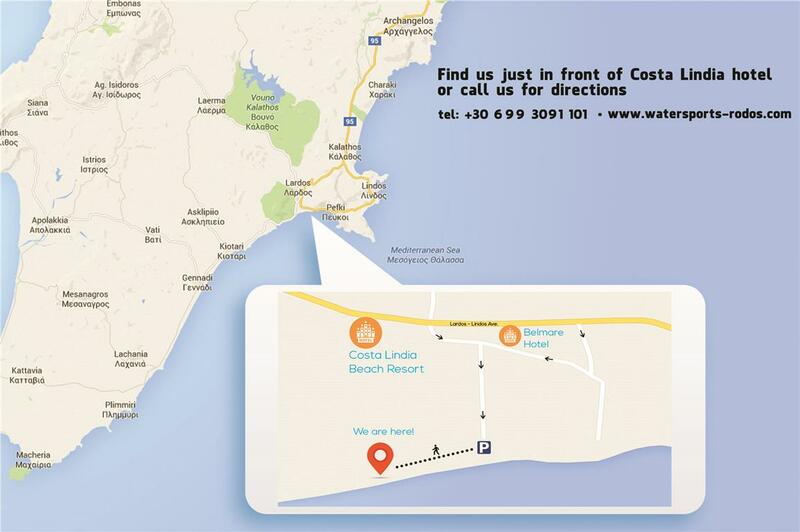 Getting to Rodos Water Sports Action is easier than ever! Rodos Water Sports Action is located at Lothiarica Beach, Lardos 85109, Rhodes, just a few km away from Lindos. Our location is easily accessible by the local transportation, by car, taxi or even walk from your residence. Just a few meters away from us there is a big parking area where you can safely park your vehicle and enjoy your water sports activities. Find all needed information below and feel free to contact us for any questions or further information. If you choose to come to us by taxi, please download our map below and show it to the taxi driver. If you choose to come by bus, stop at Belmare Hotel bus station and use the downloaded map for the easiest way to us. If your holiday residence is located near to Water Sports Action (Lardos, Pefkos or Lindos), then we will be happy to offer you free transportation from and to the water sports center. Just contact us at least a day before to arrange a meeting point and time. Find prices and information about transportation on the table below.